(CNN) -- Grace, Kara and Trichelle were created to fill a void for young black girls who for so long have been playing with dolls that don't look like them. 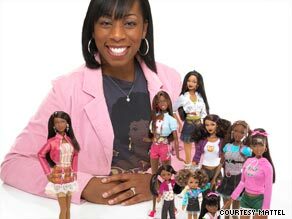 Stacy McBride-Irby, creator of the new Barbie, poses with the dolls. The new black Barbies released by Mattel have fuller lips, curlier hair and other features that the company says more accurately represent African-American women. Some have cheered the new dolls. Others jeered them, saying they're not black enough. "I love the black Barbie. It's about time," Jua Simpson said on CNN's iReport, a user-generated news community. "But the hair is still a step backwards, since most of our hair is not straight and light brown." Others disagree with critics who say the dolls should have had more natural black hairstyles, such as afros or braids. The dolls were created by Stacy McBride-Irby, an African-American who watched her daughter play with dolls and wanted to create a doll that looked more like her. McBride-Irby said she has heard the criticism, but she also has received many kudos. In 1997, Mattel collaborated with cookie maker Nabisco to create Oreo Fun Barbie. The black version of the doll, which sported an Oreo-shaped purse, was criticized by some who noted that "Oreo" is a derogatory term in the black community. The word is used to describe someone who is perceived as black on the outside and white on the inside. For some, the talk about dolls is not just child's play. Some think early play with dolls can affect a girl's self-esteem later in life. Actress Nia Long, who appears in comedian Chris Rock's new documentary, "Good Hair," recently talked about the issue on CNN. "Historically, the Afrocentric features have not been celebrated," Long said. "This makes us question the integrity of our beauty standard for ourselves."